KUALA LUMPUR: Kossan Rubber Industries Bhd, the world’s second-largest manufacturer of disposable latex gloves, is going all out to complete an overhaul of its plants for automation by 2020. For higher automation means less dependence on the uncertain — chief of which is availability of human labour, the shortage of which has cast a pall over the industry in recent years — and better cost advantage in the long term in the highly competitive business it is in. The group aims to slash its headcount per million pieces — which stands about three now — to 1.6 in five years. Kossan founder and managing director Datuk Lim Kuang Sia is a firm believer of automation and computerisation in manufacturing, also known as “Industry 4.0”. The term, coined by the Germans, means, in a nutshell, little to no human operations needed in manufacturing, as they will be replaced by robotics and the necessary algorithms. The belief is that this can be achieved via the use of cyber-physical systems, Internet of things, big data and analytics, augmented reality, additive manufacturing, simulation, horizontal and vertical system integration, autonomous robots as well as cloud computing. “Automation is the first thing we must work on before we can talk about big data or artificial intelligence. It (automation) is a key thing. Hence, we are working on the automation of our new plant while the old lines will be revamped to improve efficiency ... the building of the new plant is not only for expansion but also for transformation. New features such as automation and computerisation will be in place. Our internal target is to complete the automation of our plants by 2020,” Lim said. While the target is clear, Lim knows the company won’t be stopping there, for the adoption of more automation and technological advancement is an ongoing process, though dependent on the company’s continued capacity expansion, which itself is subject to infrastructure requirement, economic environment, regulations and demand. In 2014, Lim shared that technology would be the game changer of the rubber glove industry, and that it wouldn’t just be about expanding production capacity anymore. Since then, the group has been focusing on technological adoption to raise its automation and computerisation levels. Kossan’s new plant in Jalan Meru, Klang — which is equipped with high-speed dipping technology with a high degree of automation — is expected to commence production in a matter of months. Currently, the plant is undergoing a trial period. Once that’s over, the plant that can produce up to three billion pieces of nitrile gloves per year will be up and running. The company is also working on a new research and development (R&D) centre, which it aims to complete by the end of this year. The focus, besides on engineering and robotics to provide higher automation for its existing and new manufacturing plants, will also be on new innovation and quality improvement. Its R&D efforts have been rewarded by the discovery of its patented “low derma” technology recently, a glove-making process without the use of allergy-causing chemical accelerators that it launched last September. 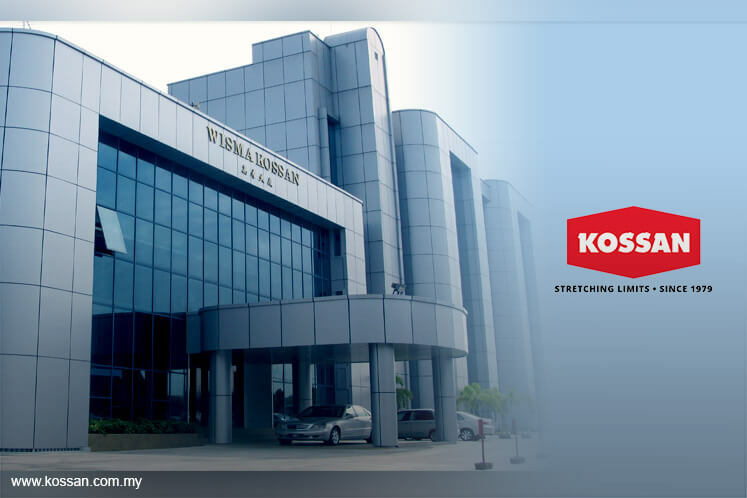 With the new technology, Kossan became the first Malaysian glove manufacturer in the world to be granted the “low dermatitis potential” claim in gloves by the US Food & Drug Administration. The “low derma” gloves already contribute to about 10% of the group’s earnings, said Lim, who expects the figure to jump to over 30% in two years as the patented-technology gloves have a wider area of application. “We don’t have enough capacity to meet the demand for them (low derma gloves) at the moment but with the completion of the new plant, we will be able to,” he added. Currently, the group’s total production capacity is at 22 billion pieces per annum, which will grow to 25 billion once its new Klang plant comes online. The group, which has continued to enjoy rising demand for gloves, saw a 21% jump in revenue in its first quarter ended March 31, 2017 to RM499.98 million from RM412.28 million. However, its bottom line slipped 9% to RM46.54 million from RM51.31 million. The group attributed the fall in earnings to the surge in raw material prices and a reversal of translation gain in foreign currency receivables. Lim said he remains confident about the group’s business going forward, as he continues to see a lot of opportunities for growth in the glove industry, especially with the rise of emerging markets in the global economy. “It is a challenging industry with issues surrounding manpower and talent with pricing pressures, competition and so on, but all these are normal in any business. The important thing is there is still a huge demand in the market. If we can transform [through automation and innovation], we can take advantage of the opportunities that present themselves,” he said. Kossan shares closed at RM7.00 last Friday, up two sen or 0.29%, a sharp rise from the low of RM5.59 they touched on May 3. At the current price level, Kossan has a trailing price-earnings ratio of 26.93 times and a market capitalisation of RM4.48 billion.